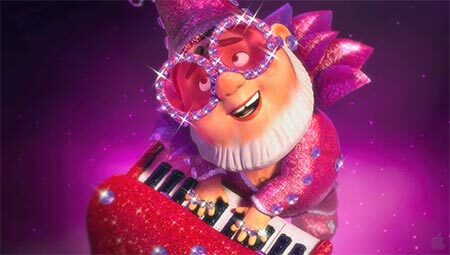 From the director of Shrek 2 comes your chance to step into the secret world of garden gnomes - Gnomeo & Juliet. Perfect for the whole family, this fresh and funny makeover of one of the world's most timeless stories features music from Sir Elton John, and the voice talents of Emily Blunt, James McAvoy and Sir Michael Cane. 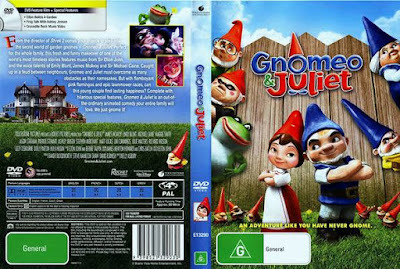 Caught up in a feud between neighbours, Gnomeo and Juliet must overcome as many obstacles as their namesakes. But with flamboyant pink flamingo and epic lawnmower races, can this young couple find lasting happiness? Now before you start, I know this film was released at the beginning of 2011 and we are now close to the end of 2015, so why has it taken me this long to finally watch this, well I have a very good explanation. Romeo and Juliet is my all time favourite tragic plays by William Shakespeare, so when someone does a remake of it either in a movie, book or some other form, I'm always sceptical. I'm just worried someone is going to destroy a story that I hold dear to me. So you can see why it took me forever to finally watch this kids adaptation. I'm so happy I sucked it up and watched it. Funny, beautiful, musical, a great combination for a kids movie. And surprisingly a great adaptation. At the moment my mind is racing wanting to write down everything I love about Gnomeo and Juliet, so where do I begin....? Okay, let me start with the music. When I heard it was not only produced by Sir Elton John, but he also did the music, it was instantly a winner. I'm a big Elton John fan, right from when I first heard his music for The Lion King. So I knew instantly I was going to fall in love with his new songs he specifically wrote for this movie; Hello, Hello and Love Builds A Garden. Such a beautiful score you can't help singing along to. Trust me, I've seen this movie at least ten times now and I can happily say I know the words to all the songs. The complete cast are absolutely perfect. Not only the characters but the actors were all a great choice. Let me just list who voiced who, and if this doesn't get you excited....then you're crazy. James McAvoy as Gnomeo; a blue gnome counterpart to Romeo Montague. Emily Blunt as Juliet; a red gnome counterpart to Juliet Capulet. Michael Caine as Lord Redbrick, the leader of the red gnomes and Juliet's overprotective widower father; counterpart to Lord Capulet. Jason Statham as Tybalt; a red gnome counterpart to Tybalt. Maggie Smith as Lady Bluebury, the leader of the blue gnomes and Gnomeo's widowed mother; counterpart to Lady Montague. Patrick Stewart as the statue of William Shakespeare. Ashley Jensen as Nanette, a plastic garden frog and Juliet's best friend; counterpart to Nurse. Stephen Merchant as Paris, a nerdy red gnome who was arranged to marry Juliet; counterpart to Count Paris. Ozzy Osbourne as Fawn, a garden deer and Tybalt's best friend; counterpart to Peter. Jim Cummings as Featherstone, a lonely plastic flamingo with a thick Spanish accent; counterpart to Friar Laurence. Hulk Hogan as Terrafirminator Announcer. Julie Walters as Ms. Montague, the elderly owner of the Blue garden. Richard Wilson as Mr. Capulet, the owner of the Red garden. Kelly Asbury as Red Goon Gnomes; counterparts to Gregory, Sampson, Anthony, and Potpan. Shroom, a silent mushroom and Gnomeo’s friend/pet; counterpart to Romeo's servant Balthasar. The Bunnies, a group of small, cement bunnies that act as servants for Lady Bluebury and others in the Blue Garden; counterparts to Abram and other miscellaneous servants of the Montagues. Dolly Parton as Dolly Gnome, the lawnmower race announcer. Julia Braams as Stone Fish, a stone fish that attached to the Fishing Gnome. In the end, it is seen being dragged by Gnomeo and Juliet's purple lawnmower. James Daniel Wilson as Fishing Gnome, a red gnome. Tim Bentinck as Conjoined Gnome Left, a red gnome. Julio Bonet as Mankini Gnome, a red gnome. Neil McCaul as Conjoined Gnome Right, a red gnome. Maurissa Horwitz as Call Me Doll, Benny's newfound girlfriend. There were too many great scenes for me to go through. I either laughed out loud or said "Ooohhh, how adorable". And once I got onto google images all I want to do is post images of some of the scenes I loved....So here is one where Gnomeo meets Juliet for the first time. I wish I can add the song to this scene as well, it's just perfect.